At Fine Art Shippers, we understand that museums and galleries, art dealers, discerning private art collectors, and some other institutions have unique needs when transporting and storing fine art objects, antiques or other luxury collectibles. 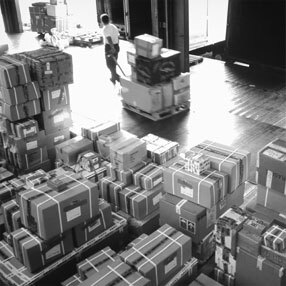 In this way, being a proven shipping company we can satisfy all the needs connected with art handling, art packing, and certainly art storage. In general, local and international shipping of fine art objects is a special branch of transportation. Its main difference is the increased vulnerability and the high value of the precious cargo. Therefore, the owner of the priceless exhibits should be fully convinced that, firstly, the property will be delivered to a warehouse in safety, and secondly, that every object will be stored in conditions that are optimal for this particular artwork. We are talking about temperature, humidity, light, etc. Art collection storage may be required, for example, by a museum or an exhibition center for the period of repair or restoration works in the exhibition hall. If the area of its own storerooms is not enough to accommodate all the exhibits and provide them with the proper storage conditions, then the most reasonable solution is the transportation of artworks to our secure warehouse for safekeeping. Besides, the art storage service may also be required by private collectors and lovers of artifact, antique, and vintage items, or simply by people who need to store somewhere their furniture, large-sized technique, home furnishings, as well as books and papers for the period of repairs. This is convenient, speeds up the repair process, and protects your property from any damage. However, security and confidentiality are two main features for any type of storage, whether it is fine furniture storage or art collection storage. Fine Art Shippers have a secure warehouse equipped with modern and sophisticated intruder alarms and fire protection systems guarding all your precious property 24 hours a day. Moreover, it is approved by leading international insurance companies and covered itself with the umbrella insurance. So what do we offer? And many others fine arts services that you may require. Contact Fine Art Shippers specialists for more information on available art storage options or to discuss your own requirements in more detail. We will choose for you the best possible solution according to your needs and on your budget.